DAYTONA BEACH, Fla.—SpeedSource Race Engineering has been developing and racing Mazdas since 1995, so it seemed the obvious team for the factory to pick to develop and race the 2013 Rolex Sportscar Series GX-class Mazda6 diesel. SpeedSource came through with nine wins and the GX manufacturers Championship. For 2014 Mazda wanted to move up to the Prototype class of the New Tudor United SportsCar Championship, using the same SkyActiv-D twin-turbo I4 diesel, redesigned for use as a semi-stressed member and tuned to a much higher output and stuck in a Multimatic/Lola chassis. This was a tall order, and results showed it: the car often DNF’d and usually ran at the back of the GT pack, barely ahead of the mostly stock GTD cars. In P2 form the engine had plenty of torque—enough to break drivetrain parts—but too little power, and it generated much too much heat. The twin-cam, two-stage diesel used the same cooling system for both the engine and the intercoolers, and there simply wasn’t enough room under the engine cover to keep air flowing to everything that needed it. Mazda and SpeedSource believed the engine could work, and they kept developing different solutions until finally they got one to work. 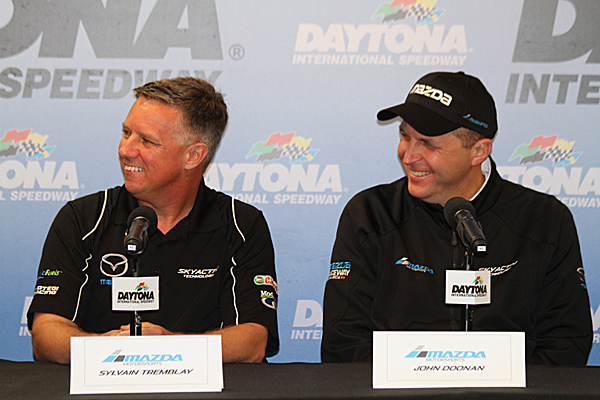 Mazda Motorsports Director John Doonan and SpeedSource owner/driver Sylvain Tremblay discussed the new performance at a press event at the Roar on Friday, Jan. 9. Doonan was not afraid to be court hyperbole in his choice of words—and the numbers supported him. “One year ago on this particular weekend there weren’t many smiling faces in the garage area around this program,” he began. “But yesterday [I was saying] words like remarkable, words like miracle … we’re talking about 20 mph in straight-line gained, six to seven seconds lap time … at this particular track which isn’t necessarily a place where that allows us to show the strength of this engine in a straight line. We are doings exactly what we set out to do—the first time anyone’s taken a road-going diesel engine and asked it to do three times what it was designed to do. Every factory racing program wants to win to polish the factory’s image—and every racing department tries to sell the program to the accountants by talking about “technology transfer” and “racing improves the breed.” Not only was the SpeedSource Mazda significantly speedier—it was breaking new ground for stock-based racing diesels and applied diesel technology in general. “We’ve been able to decouple the heat from the water and the heat from the turbo,” Doonan explained. “Being a compound diesel engine we produce about a third more heat than a petrol engine, so that heat has to go someplace. Before it was tied into our water system. With the modified powerplant the Multimatic Mazdas were hitting almost 180 mph through the speed trap, 20 mph faster than 2014, and had shaved ten seconds off the laptime. While still at the back of the field, now they red Mazdas were at the back of the Prototype field. “Now we can see the other cars—before they were so far away we would have to ask, Are we doing the right thing or ?” said Sylvain Tremblay. “Now we know the hard work has gotten us that much closer; now we can taste it. On the infield we are as good as if not better than some of the cars, and the trap speed is now within reach. Some people, seeing the dismal 2014 results, faulted Mazda Motorsports for not taking the program seriously. 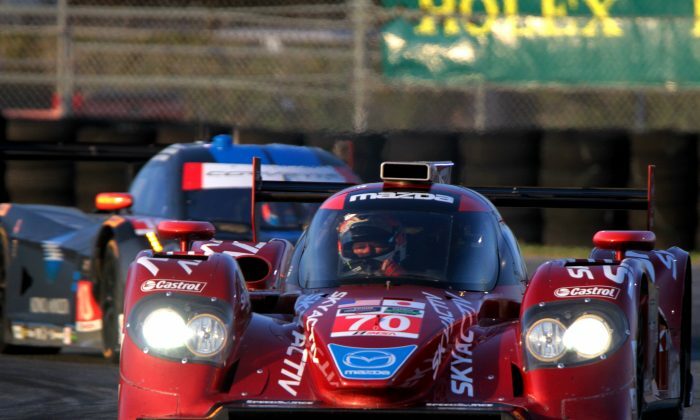 What people didn’t see was that behind the scenes Mazda and SpeedSource were hiring and integrating staff including engineers Link Smith and Jeff Braun who between them had about half a dozen prototype championships in several series. SpeedSource also worked with Multimatic to set up a dedicated engineering department doing real-time simulations 60 hours a week, delivering set-up solutions to the track during practice and racing sessions, instead of analyzing after the event has ended. With the new car finally able to make full use of its downforce potential and thus finally able to load the suspension properly, laptimes have already tumbled; add to that the constant tuning from Multimatic and the car could reasonably be a podium contender, particularly at some of the twistier tracks. 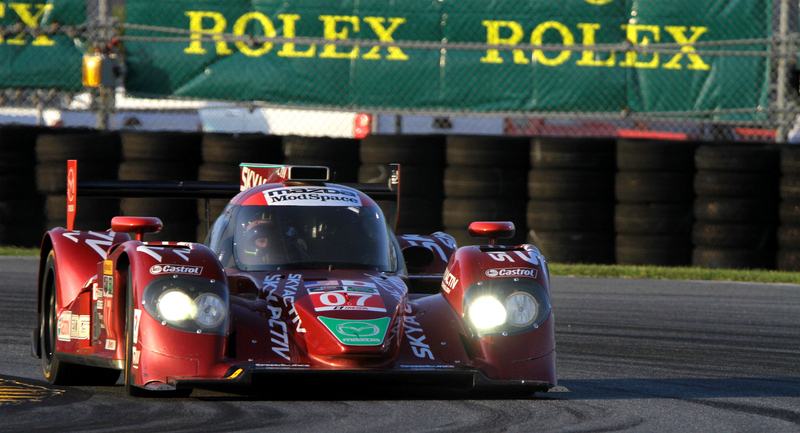 The SpeedSopurce Mazda team makes its Tudor Championshipo debut at the Rolex 24 at Daytona, Jan. 24–25. Tickets are available through the Daytona International Speedway website, and for those who can’t make it, the action starts at 2 p.m. ET on your local Fox affiliate.